A while back, when my now-83-year-old mom first fell, I ordered Medical Care Alert system, which provides a device to wear around the neck. That device goes off automatically when someone falls, and in addition, it has a button to push for emergency assistance. 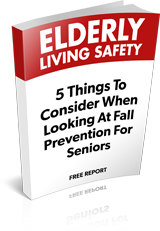 My mom fell a few more times since receiving the system, and each of those times, the system saved the day, and in doing so, gave me peace of mind that my mom would be safe at her independent living center for seniors. This past Thanksgiving weekend, however, the device malfunctioned twice, when my mom fell – failing both times to alert the monitoring system, and therefore, the paramedics. My mother was left stranded on the floor, screaming for help for who knows how long. On the night of Monday November 27, when I got back from vacation and found out what had happened, I called the company to alert them to the failure of their system. I was advised that my mother should test the device, and that if it did not work, a new one would be sent out. I informed Lisa that her response was completely inappropriate – that it was incumbent upon her to show concern about the failure of the device and the consequences for my mother, and that, furthermore, her company was legally liable for the failure of the device working. I then told Lisa that I wanted a new device shipped overnight to my mother. She told me that it would not go out until the next day and that I would have to pay for the added expense of express shipment. I said that the company should pay for it, given that the device had failed and put my mother’s life at risk in doing so. I asked to speak with the supervisor about the payment issue. I was told the supervisor was not available but could call me back in the next day or so. I told Lisa to go ahead and order the express shipment of the device. She again said it would not go out until the next day, and that I would have to pay for it. I said that I understood, and once again told her to go ahead and send it overnight delivery, whoever pays for it. I then asked her, twice, to confirm that she had in fact scheduled the overnight delivery. Both times, she assured me it was scheduled to go out on Wednesday morning and arrive on Thursday. On Thursday, I called my mom to check that she had received the device. She had been at a medical appointment earlier in the day and was wiped out from the excursion. I could tell she had no energy left, so I let her just rest. On Friday, her caregiver was driving her to a doctor’s appointment, so I called the caregiver and asked if the device had arrived. Around that time, I checked my voicemail and discovered that Sue, the company manager, had called earlier that day, ie, Friday – three days after I had spoken with Lisa – leaving a message asking me if my mother had found her device. I promptly called Medical Care Alert, where Justin – who answered the phone – informed me that no device had been sent. Instead, it turned out, Lisa had called my mom on Wednesday, to see if my mom had found the device. Justin couldn’t care less about the company’s failures or the potentially life-endangering consequences for my mother, even when I spelled out that she suddenly was having acute neurological problems that either caused or were caused by the fall. Instead, he casually offered to send the device out to me. On Monday – ie, a full week after I had first requested that it be express mailed overnight. Not only that, but when I pointed out that the company had failed to come through on its promise to send it on Wednesday; when I additionally pointed out that my mother’s life was on the line as a result; and when I said that I therefore needed the device sent overnight delivery on Saturday, so that I would arrive as soon as possible, Justin was quick to inform me that I would have to pay for the extra cost. Again, I said that the company should pay for it, given that their mechanism malfunctioned and that they additionally failed to come through on sending a new device when they had promised me to do so. Regardless, I continued, they should send it express mail, and I would take up the payment issue with the company supervisor – whom I asked again to have call me. At this point, I’m looking for a new medical care alert company. Meanwhile, however, as it takes time to get set up with a new system, and as Lisa advised me that the devices would be in tomorrow, I asked – yet again – for a new device to be sent to my mother. Lisa informed me that it would be sent by priority mail. I told her (trying really, really hard not to pull out every strand of my hair) that I needed it express mailed overnight. “You’ll need to pay extra for that,” she said.